The best way to help frozen pipes is by preventing them altogether, which we will get to below. But there’s a good chance if you’ve come across this blog post that you already have frozen pipes and are wondering how to manage them. If you have frozen pipes, the best thing for you to do is to call in a professional plumber. We can assist with the thawing process so you have less risk of burst pipes, and we’ll be there in case something does go amiss with the process so we can mitigate the damage as much as possible. So what can you do next fall, before temperatures dip again, to avoid this problem altogether? Here’s a brief step-by-step guide. Open Your Faucets: We’re talking about faucets connected to pipes that are susceptible to freezing—so mainly, outdoor faucets. Open these faucets and let them drain, and then leave them open. You may even consider getting insulated caps for the faucet heads. Disconnect Hoses: Drain them first, to ensure minimal water is left in them, and then store them someplace that doesn’t reach freezing temperatures. Insulate Pipes: There are some pipes in your home that are exposed, yet not outside where it gets the coldest. We’re talking about your plumbing in your basement, as well as under your sinks. You can get affordable insulating sleeves at any hardware store, or even use towels if you’d rather go that route. Either way, this helps keep the temperature of the water in the pipes from dropping too low. Keep Cabinets Open: Speaking of those pipes under the sink—keeping your cabinets open even just a crack helps the heat from your furnace or heating system reach them to make them less likely to freeze. 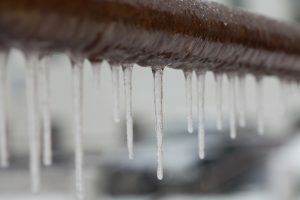 You may not think about these pipes freezing because they’re indoors, but they often run behind walls that face outdoors, exposing them to colder temperatures. Contact us today to see why our customers keep saying “I Love My Design Comfort!” We provide professional plumbing in Salt Lake City, UT and beyond.